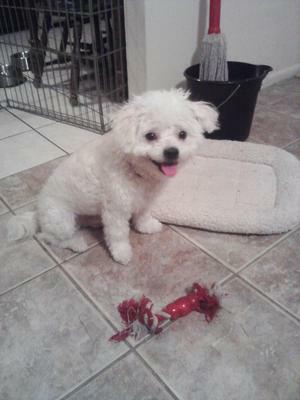 Oh my Bichon Maltese mix is so beautiful, intelligent, and such a fun-loving little soul. She was easily house trained, and behaves herself very well, she is definitely a true "lady". I feel very lucky to have her in my life. I have always had larger breeds of dogs throughout my life, but I got introduced to the Bichon Maltese through a friend, and boy am I glad. She is just fantastic. An absolute joy. Everyone says that she is lucky to have me, but they are so very wrong, I'm definitely the lucky one. How much does this beautiful dog weigh ? Dear Gucci, Hi! 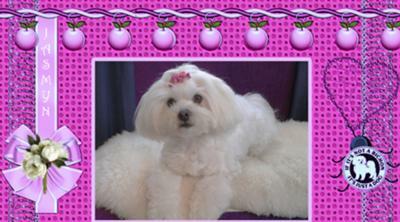 We are 2 Maltese dogs, and we are glad you have joined us at the place for the Maniacs! Also, we hope you will post your pikture as it sounds like you are very cute. Also, do you ever get confused and think, am I a designer handbag, or am I a dog? If you are wondering, you are a dog. Love, Your PaLs, LuLu and LoLLy! 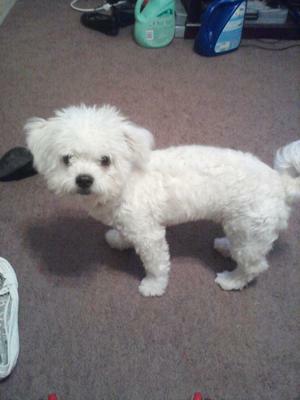 Max is a 9 month old Bichon Maltese mix. I've had him since he was 9 weeks old. He is spoiled rotten. Sleeps with me and at 10p.m insists it is time to go to bed. 7:30 a,m is time to go for walk in the park while everything is nice and dewy. Wants to smell all the gopher holes, and ground squirrel mounds, and chase the birds. Finicky eater from day one. Loves his homemade treats and won't eat any others. 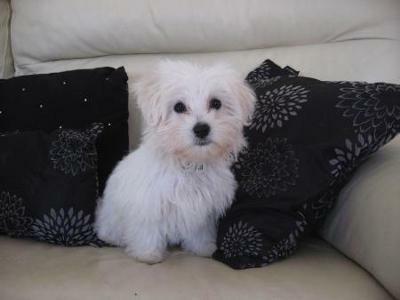 My little female Maltese Bichon Sugar is very loving, playful and a joy to be around. She loves everyone, especially little kids, and other dogs, though if an unfriendly dog growls or menaces her, she'll stand her ground. She bosses me around, and decides when we wake up by making funny little noises and sitting on my head! If I pick up one of her many toys and don't throw it immediately, she scolds me in no uncertain woofs. 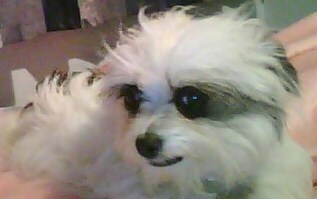 Everyone comments on what a beautiful little dog she is. She knows it!! 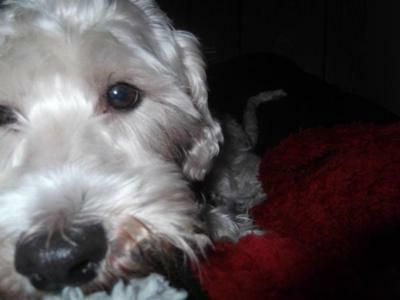 Boomer is a very sweet Bichon Maltese dog. He always knows when you are looking at him and is rarely caught off guard. He's playful and loving. When I was sick Boom slept when I slept and ate when I ate. All in all he is an awesome dog! *Loves jumping,licking your face,eating,playing fetch with a stick,chewing on anything plastic,etc-yogurt-ice-cream containers,doggy treats. *She is scared of loud things etc-lightning,thunder,loud music,yelling,shouting,loud motors. *My Maltichon likes standing on her back legs,and lying on the roof of her kennel. 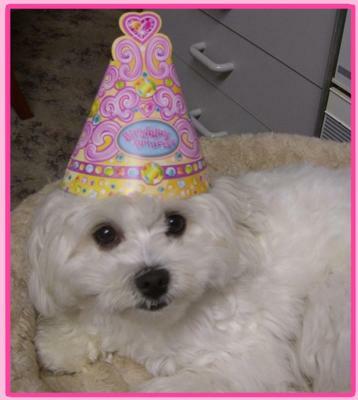 When I brought home my Bichon Maltese dog Kira, she was shy and reserved, not even coming out of her cage to eat! When she was around that age, she was very fragile, being the runt of the litter. After the 3rd day of silence, I offered her a treat, took her for a walk and a lasting bond began. A year later, she acts like a guard dog almost, barking at any visitor coming up the walk, seconds before the get to the door. She is very curious about everything, sniffing anything we come by. She is sociable and outgoing, two traits which make for a wonderful family dog. Kids love her because of her playful, sweet nature. Her coat is slightly curled and off-white, but as a puppy her ears where a pale graham brown. 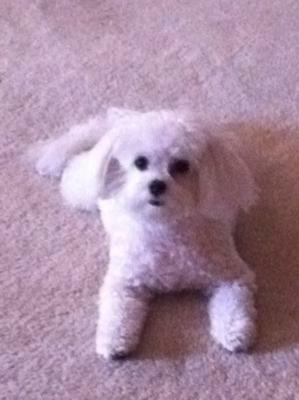 Our Bichon Maltese mix is very affectionate, great with kids, and smart and cute. We wouldn't trade her for the world. We got her when she was about 3.5 months old, and she just turned 2. Perfect for a family w/little kids and husbands with allergies. No problems sneezing around Princess. Great dog, great breed. We Love Her!